supine with reverse trendelenburg or use of arm and leg weights can help prevent patient migration to the top of the bed with addition of weights. 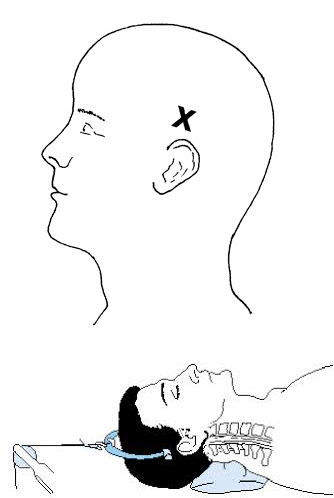 pin placement is 1 cm above pinna, in line with external auditory meatus and below the equator of the skull. if the pin is placed too posterior, it can apply a flexion moment to the cervical spine. a posterior pin with a flexion moment may facilitate reduction of a facet dislocation. stainless steel pins have higher failure loads than titanium and MRI-compatible graphite and should be used with traction of > 50lbs. an initial 10lbs is added. rotate the head 40 degrees beyond midline in one direction, and then rotate 40 degrees in the other direction while axial traction is maintained. a bilateral, irreducible facet dislocation is unstable and should be treatment with urgent open reduction after an MRI is performed..
with any change in the neurologic exam the weights should be removed and an MRI should be obtained.